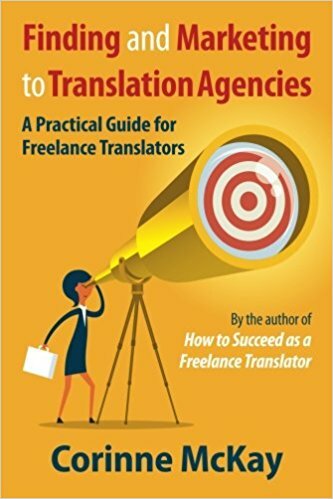 Failing to get paid for a translation you provided to a client is always a risk; I think it’s unlikely that anyone goes through an entire freelance career without at least a couple of non-payment situations. Vet all agencies in advance. This one is so basic, yet many translators skip this step. If you work with agencies, ever, at all, in any fashion, get yourself a membership to a translation agency rating service. I use Payment Practices, and the ProZ Blue Board is also an option. In my experience, the Blue Board tends to have more current feedback, and more feedback on agencies outside the US, but the feedback on Payment Practices is often more candid. I find it both heartbreaking and frustrating when I (not infrequently) get e-mails from translators saying, “I did a huge job for this agency and they never paid me!” And in–literally–30 seconds of searching on Payment Practices, I can tell that this agency never pays anyone. They’re scammers, and the translator could have easily avoided this mess, but either a) didn’t know that such rating services exist, b) was too lazy to check, or c) didn’t feel that they needed to invest $20 a year in not getting scammed. Require individuals to pay in advance. Some translators hate working with individual clients. I happen to love it, but I also realize that individuals need to be treated differently from established businesses. In the non-payment situation I referenced above, the individual simply evaporated: didn’t pay me, didn’t answer my phone calls or e-mails and refused to sign for a certified letter. My only options were to try to go see them in person, or take it to small claims court (then try to collect? ), or drop it, which I did. Now, I do not do an individual’s translation until they pay, even for large projects. Risk of non-payment=zero. When in doubt, ask for a deposit. You know those e-mails we all get: “You don’t know me, but I have this great project for you”? Lots of translators spend lots of time trying to figure out if they’re scams–which they are, most of the time, but not all of the time. There’s an easy solution: reply, and inform this potential client that for all new clients, you require a 50% deposit, to be paid by credit card or wire transfer (not by check). If you never hear from them, it was a scam. If it’s legitimate, most clients will understand that–especially for largish projects–a 50% deposit is reasonable. Stay on top of habitually late-paying clients. Many freelancers have clients who always pay…eventually. Whether due to a cumbersome accounting system, a lack of cash flow, or some other factor, these clients will exceed their stated payment terms by weeks and even months. In these cases, I think you have two options. With clients who just don’t get around to paying on time, increase your level of reminders. Upon sending the invoice, remind them, “Just for reference, this invoice is due on May 9 and I look forward to receiving your payment on or before that date.” Then, one week before the payment is due, remind again. “In looking over my accounting, I see that invoice number X for Y amount is due next week; can you confirm that everything is on track for that?” Hopefully, they’ll get the point. Sometimes, it is really just a series of unfortunate events. Last year, I had a client who owed me 3,000 euros for over three months: I was out of town in July, then they closed for the month of August, then the accountant went on maternity leave, etc. etc. But if it’s a pattern, they need to know it’s not acceptable.With clients that seem to be having cash flow problems, where you either suspect or know for sure that they are waiting until they get paid before they pay you, proceed with caution: limit your exposure to not more than you can afford to lose if they go bankrupt. Also remember that you always have the option to stop working with a client whose business dealings you find disrespectful. Finally, don’t blame yourself if you’ve done everything right and still don’t get paid. This happens, especially if a client “plays dead” and simply never responds to you, or to a collection agency, or anything else (see above, about the client who refused a certified letter, claiming “There’s no one here by that name”). I haven’t experienced this with a non-payer, but I have experienced it with an agency whose outsourced writers plagiarized my blog posts, admitted to it, and then did it again. In the end, I had no choice except to take them to court, which is time-consuming, expensive, and a waste of emotional energy that I’d rather put into something positive. Sometimes, mean-spirited people will get the better of honest people, and you have to just let it go and chalk it up to the cost of doing business. So that’s a bonus tip: just as stores get shoplifted, you as a freelancer will probably get scammed at least once in your career due to no fault of your own. Readers, over to you: your thoughts on making sure you get paid? Per-word versus hourly income: can someone explain this? I have been a translator for 12 years now and I am pretty happy to say that I never had any non payment situation. I can thank one person, who gave me the best tips, during a presentation in Paris, many years ago. Yes Corinne, I am talking about you. Thank you for recommending Payment Practices and for all your useful advices. I had a few difficult situations where I had to beg and beg for months, but they finally paid. Payment Practices is definitively one of my favorite tool. Thanks Nathalie, that’s very sweet of you to say! Glad you enjoyed the post. One of things I love about being a freelancer is the ability to set your own terms! However, I learned the hard way. Before changing my payment terms, I remember that at one point several years ago I was owed nearly $1,500 by around 7 different clients (mostly small jobs) who didn’t respect the pay-by date. So, like you, I now request full payment before sending out completed translations to my direct clients. But, during that time, I also learned that weekly payment reminders were a not-so-invasive/polite way of reminding those clients to pay (especially when sent out in standardized format, which makes them less personal). Besides direct clients, I only work for a couple of well-established agencies who always (thankfully) pay on time on a monthly basis. That’s all very good advice! Just the other day I received an e-mail from a “client” via Proz asking if I was available for a document translation. No deadline, no question about my rate, no description of the text. So I was instantly suspicious. When the file came, I put one sentence into Google and noticed it was a chunk of text out of a book on books.google.com – and not even a full chapter either. Then I googled one of the sentences in the e-mail and landed on a Proz forum post about a scammer. Apparently they tell you they will pay you in advance, then they overpay you with a fake check and ask you to pay back the amount they overpaid. And when you do that, the bank realizes the original check was fake and that money is taken out of your account again, too. So yes, always be suspicious. Sadly, it works often enough to be worth it to the scammers. Thanks, Veronika! YES, that’s exactly the kind of situation I was referring to when I mentioned getting paid in advance by wire transfer or credit card, NOT check. I know a local writer who got caught in a similar scam: the client sent a check, then “cancelled the project” and asked her to refund the money, which she did, then the check turned out to be fake, so she was out for the money. Ever since I’ve lived in Europe, I have asked myself why the United States does not have stricter banking rules and regulations regarding wire transfers between creditors and debtors. The banking fraud described above should simply either be extremely difficult or impossible. First, the United States should just abolish checks. They are an old & outdated form of money transfer that is liable to abuse, as people are attesting to here. Second, wire transfers should be free in the United States. I live and work in Germany, where there are no checks and where wire transfers are not only free, but also the norm. What is more, a debtor generally has eight weeks to report fraudulent activity by the creditor that took place during a wire transfer to or from one’s bank account. After the report, the bank will simply transfer back any money to the debtor’s account and block the creditor’s ability to debit funds from that account. This is not to say that the report is without fuss & hassles occasionally. There are lots of instances in which the mechanism described above has failed. But those instances usually involve a somewhat comprehensive scam, typically aimed at the elderly. The media & the government generally report far and wide to alert the general public about the scam, and the scam goes away shortly thereafter … until another one comes along. The damage is generally minimal, however. To the best of my knowledge, the banks even work with individuals either to help recover the funds or to help safeguard the individuals in the future. I am an American, and it is incomprehensible to me that the United States is still banking in the dark ages. Thanks, Peter! Yes, “dark ages is right.” Get this: I have my business and personal accounts at two different banks. Business accounts at Chase, personal at a local credit union. If I transfer money between them electronically, it takes 2-3 business days, which can sometimes be up to 5 calendar days (i.e. if I transfer the money at 4 PM on Friday, it might not be in the other account until Wednesday morning). But if I write a paper check, photograph it with my phone and deposit it via the bank’s app, the transfer is instant. The US banking system really has “features” that have to be seen to be believed. As unpleasant as it can be at times, payment in advance is the best way to go. It doesn’t have to be full payment, of course, but that’s when you find out how serious your potential customer is or not. Thanks for that comment! Yes, it definitely reduces the risk of non-payment to zero, that’s for sure!